BELLEVILLE – It is an exciting time for Leafs fans as the team makes its way to playoffs for the first time in four years. People from the area say they are feeling a sense of surprise – whether a fan of the team or not. 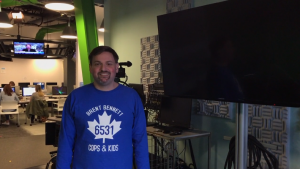 Ben Forgie, professor in the Television and New Media Production program at Loyalist College was nervous for the Leafs in the playoff-clinching game. Photo by Olivia Timm, QNet News. Ben Forgie is a Television and New Media professor at Loyalist College and has been a Leafs fan since he was a young boy collecting hockey cards. He and his father often watch the Leafs games together, but when they beat the Penguins 5-3 Saturday night to score a spot in playoff action, he said it was a special night. they clinched it,” said Forgie. Loyalist students, past and present, said the win surprised them as well. 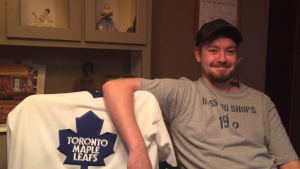 Steven Sedore, electrical engineering technician graduate from Loyalist College, cheers for the Leafs. Photo by Olivia Timm, QNet News. Steven Sedore is an avid Leafs fan and graduate of the Electrical Engineering program at the college. “It’s obviously very exciting to be in playoffs, and they have already far exceeded my expectations. They maintained their position in the standings in hunt of a playoff spot, and then with them going on the run they did after deadline cemented it,” said Sedore. He says there is no better hockey than playoff hockey. On the other hand, Trent University student and hockey fan, Clinton Davis, said the team has exceeded everyone’s expectations. Although the Leafs are not his favourite team, he said he was shocked to see them make the playoffs. “I was surprised because at the start of the season, they were not expected to make the playoffs. Especially with the number of rookies, but Austin Matthews scored 40 goals to lead the team,” said Davis. Even for fans who lost interest in the team, news of the Leafs making it to the playoffs is drawing them back in. Jack Miller, Quinte Broadcasting sports director, says this is an exciting time for hockey fans. Photo by Olivia Timm, QNet News. 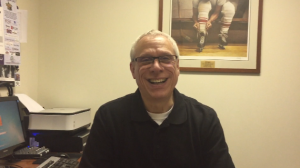 Jack Miller has been the sports director for Quinte Broadcasting for more than 30 years. He said he was turned off the team for a number of years, but he is excited to see how the team does in playoffs. He says that the team has improved in the last year, and he’s excited to see them do well. With the news of the Leafs making the playoffs, Miller says his reaction was anticlimactic because the team was expected to clinch a week earlier than they did. He says as the team lost some key games, the nail-biting began. Of the original six NHL teams, five of them have made it to playoffs – the odd man out being Detroit. Miller says this is an exciting time for hockey fans. The Maple Leafs have exceeded many expectations this far, and Miller says if they do get by Washington, it will be a huge upset. Toronto Maple Leafs take on the Washington Capitals in the first round of playoffs tonight at 7 p.m.